Founded by Bower Media’s Charlene Bower, Ladies Offroad Network is dedicated to supporting ALL offroad ladies by guiding, educating, and motivating them to achieve their goals. 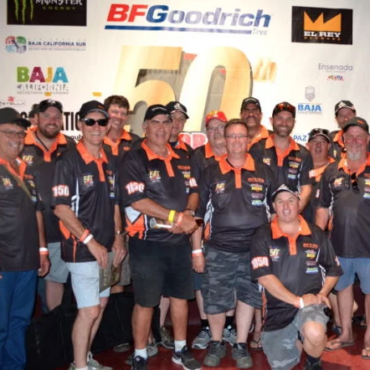 Whether they are a driver, co-driver, racer, passenger, mother, business owner, worker, or hobbyist, they are welcome. 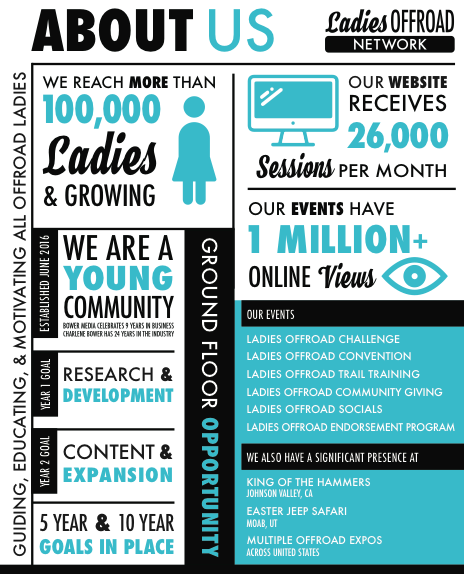 We aim to meet the needs of every lady who loves offroad by providing a space to learn more about offroad sports, chat with ladies from around the world, and share stories with the same passionate community. 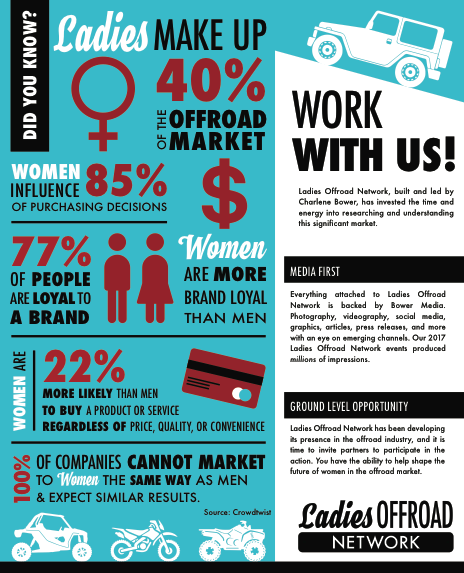 Partnering with Ladies Offroad Network does not mean you are receiving ONE outlet for exposure. As a media company first (Bower Media), we understand ALL the different outlets and voices that can be used. The Website is our Hub with a interactive Member Area. We have a presence on all the social media sites including Facebook, Instagram and Pinterest. We post daily and host between 3-10 LIVE online events per month. Hands-On Events range from our 4-day Convention and Adventure Retreats, weekend Challenges, 5-hour Trail Trainings, to hourly or pass through Socials at others events. We mail out a bi-monthly newsletter recapping all the activity. We also mail welcome packages, thank you notes and birthday cards. All of our store order shipments get mailed with additional marketing materials and goodies from our partners. Being part of our events gives hands on impressions with your brand. We love to gift, but it's not everything thrown into one big bag, there is a lot of thought that goes into making sure that your investment gets the biggest impact possible. 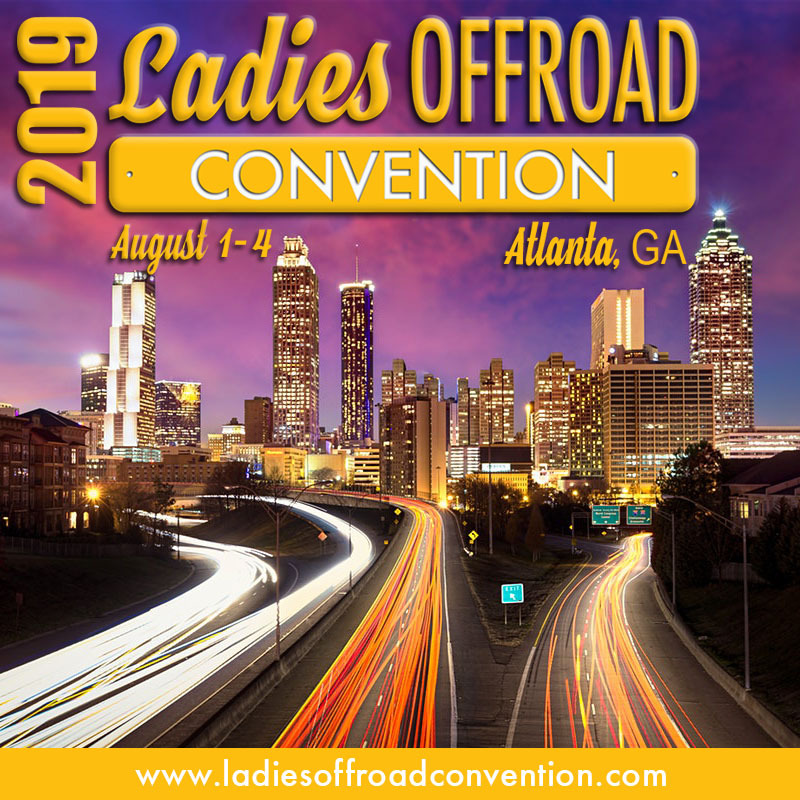 Ladies Offroad Convention is our Flagship Event. If there is one event of the year we encourage ladies to attend, this is it. The ultimate reunion, learning experience, location experience and more. Ladies Offroad Challenge will be changing significantly for 2019. Stay Tuned. Ladies Offroad Retreat is a multi-day trip hosted by an adventure company for our members. They are adventurous while educational. 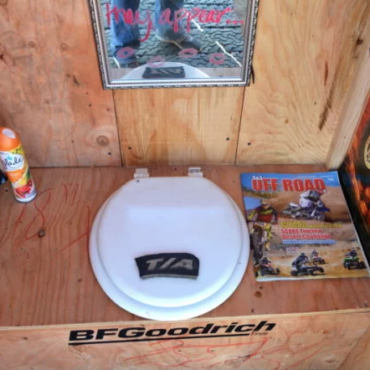 Ladies Offroad Experiences or Socials are hosted at events across the country. We can partner with your company to make your booth a location for one of these opportunities. Experiences have hands-on elements or one-off opportunities just for the ladies involved. Socials are more casual. Year 1: We focused on Research and Development. What do these ladies want? What makes them tick? How can we successfully help them be better offroaders? We got the info! Year 2: We focused on gaining a paying membership base. In just under 1 year we hit 200 members!! Significantly, that was using a soft sale, not a strong push. We continued to understand needs and offer more to members as the year went along. The numbers for our website are from mid-year 2. Year 3: We are open for Business! It's time for partners to join in on the fun! We have a significant group of ladies that are purchasers and I understand what the market wants. Our Goal is to have 500 members at the end of Year 3! Charlene is a numbers person. She understands in order to justify a investment there has to be sales to back it. Lady offroaders are purchasers and we have noticed how this significant piece of the market has not had the communication they would like to make educated decisions. "If mama ain't happy, nobody is happy" is the 'ol saying that is now translated into "If the lady of the house doesn't understand the value and significance to the purchase she isn't as prone to give it her blessing. If she is educated on the value and significance, she is pushing for the purchase." Minimum 1/4 page feature content in Bi-Monthly Print Newsletter. Your company logo will appear on all print materials. The opportunity for lifetime advertisement in published content or media (720x200px). One advertorial post per month on the Ladies Offroad Network Facebook & Instagram. Advertorial post included in email blast to Ladies Offroad Network and Bower Media groups. 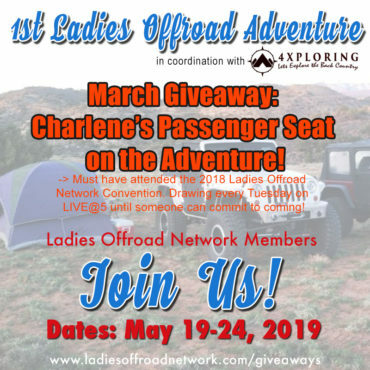 The opportunity to participate in the Ladies Offroad Network Flag program. The opportunity to supply products for monthly giveaways, enrollment gifts, etc. Your company will be featured as Industry Master on the partners page on website with a paragraph & content feed. Your company will be introduced as an Industry Master during Ladies Offroad Network Tours. Your company will be part of all Ladies Offroad Network happenings for 12 months, including next year’s rollouts at no additional costs. Monthly statistics and recap sent with upcoming opportunities. Additional Items * on the Small Business list included. + Do you have other ideas? Let’s do something out of the box together! 1/6 page feature content in Bi-Monthly Print Newsletter. One advertorial post every 2 months on the Ladies Offroad Network Facebook & Instagram. Your company will be featured as Industry Leader on the partners page on website with a paragraph & content feed. Your company will be introduced as an Industry Leader during Ladies Offroad Network Online Tours. Your company will receive 50% off all new Ladies Offroad Network rollouts for 12 months. 1/8 page feature content in Bi-Monthly Print Newsletter. Your company will be featured as Industry Stable on the partners page on website with a paragraph & content feed. Your company will be introduced as a Stable Industry partner during Ladies Offroad Network Tours. Your company will receive 10% off all new Ladies Offroad Network rollouts for 12 months. Space Dependent feature content in Bi-Monthly Print Newsletter. Your company will be featured as Industry Growth on the partners page on website with a paragraph & content feed. 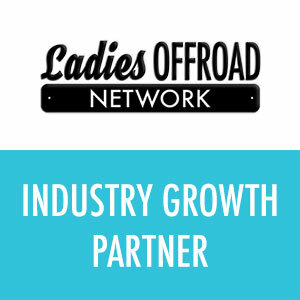 Your company will be introduced as a Growing Industry partner during Ladies Offroad Network Tours. This partnership is for small businesses, event promoters, preferred dealerships and shops, and lady-specific businesses that would like to use Ladies Offroad Network to discuss and promote their businesses. Access to promote product(s) and/or service(s) to Ladies Offroad Network members via Social Media & Groups. Featured under Small Business on the partners page on our website with a description & content feed. Understand each of the line items with some additional notes about each. Compare the packages by the reference at the bottom. Title Partnership for a Ladies Offroad Network event during the calendar year of partnership. We will work together on what the best fit is for the company. Could be associated with the Challenge, Convention, Games or otherwise. The website is the hub to our Network. Depending on the package depends on the location of ad space. 728x90 Header is reserved for Masters. 370x370 is a large sidebar ad. 125x125 is a grid sidebar ad. We produce a Bi-Monthly print newsletter that is shipped to our members and larger mailing list. The package dictates the size of space we will use to add feature content about your product. This is not an ad. Only our Industry Master partners will have their logo featured on all our print materials. As we have fliers, thank you notes, marketing pieces and other print materials made, our partners will be featured. A 720x200 ad will be embedded into content that will live forever. This ad needs to be generic and non-timely because we will never be able to change or remove it. It is literally put inside the article for a lifetime! 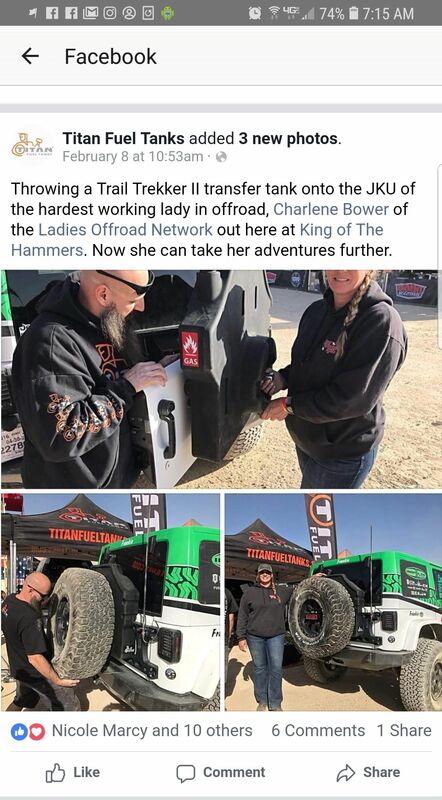 You are encouraged to supply an article or we can produce an article for Ladies Offroad Network that uses education to highlight a product feature. We post on all our social outlets when a new article is released. Advertorial post on the Ladies Offroad Network Facebook and Instagram social pages that have significant engagement. This could be a share of a sale/discount, or a specific post about a product or company. 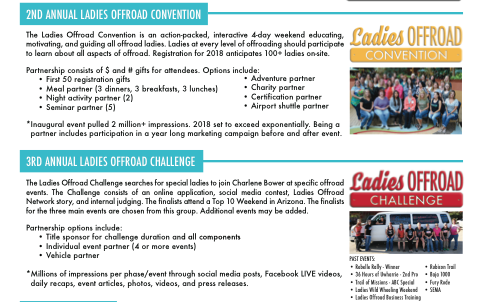 Advertorial post included in email blast to Ladies Offroad Network and Bower Media groups. This could be a share of a sale/discount, or a specific post about a product or company. These are not scheduled. You are encouraged to participate in the Ladies Offroad Network Event Flag program. Put it up it while you are at an event to let ladies know that you are a 'safe zone' for questions and information. Games may be based around the flags. The opportunity to supply products for monthly giveaways that have a full months of exposure and a lifetime post. Items can be supplied for enrollment gifts, event gifts and promotions with associated exposure. Membership advantages for in-house business ladies that can communicate your messaging to the group. Memberships is for the duration of the partnership. Will have special Partner Permissions to see partner and member only pages. Click Here for membership outline. Your company will be featured under the respected partner package group on the website with a paragraph, buy-now link and content feed. We lead people to this page regularly. Click Here to visit. Your company will be featured under the respected partner package group on the website with a paragraph, buy-now link and content feed. This page is featured during our Free Online Tours. Click Here to visit. We are growing continuously with new projects on the schedule to continually roll-out. Your company will be first in line to participate in these projects and take the discount listed below for the life of the contract. We know you have to answer to your accounting department and the head of the company and we are all about numbers ourselves. We will provide a monthly report with statistics and recap information that you can use in reports. Your company will have the exclusive feature to supply Ladies Offroad Network members with coupon codes or special promotions via a members only portal page with the information listed. We are very interested in market research and understanding the lady that is involved in the offroad industry as a whole. You will have access to our data and if you have a specific series of questions we can run the research for you! You have the opportunity to supply an unlimited number of unique articles, with link-backs, for us to post on Ladies Offroad Network. We post on all our social outlets when a new article is released. Your company has the ability to submit all events to have them listed on the Bower Media and Ladies Offroad Network calendar. We can work together on the Tablet Giveaway program and the Network'ing events. 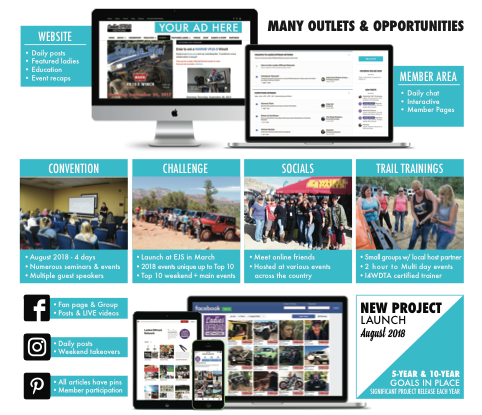 Being a partner with Ladies Offroad Network puts you into my bigger circle to be included in open communication about Bower Media projects that you can participate in. We are hoping to answer most of your questions. Don't hesitate to reach out with more! We are not a receivables company, in fact, I'm horrible at it! We have set up a simple recurring credit card process to use. Pick the card that you get the most airline points or bonuses and let it recur monthly. If you absolutely need to pay by invoice and check, we will put you onto a quarterly payment process. Benefits do not start until the first check has been received or credit card has been processed. No and Yes. I want everyone to be able to share through education, so we will not be limiting partnerships per brand category. However, we will only allow one brand category company to be a Industry Master. These are the companies that are at the top of the category and we are working hand-in-hand, day-to-day to with. How are the Articles Distributed? Articles that are released on the website have a full series of social posts through Facebook, Instagram and Pinterest. They will also have the featured image and a link in our monthly printed newsletter. It is possible it could be featured in an email blast. How is Ladies Offroad Network going to help sell our products? We are selling through education. This is the most important factor to consider when delivering content or opportunities to our group. In your area on the website, there is a Buy-Now link. The link destination will be determined when setting up your account. Ladies Offroad Network does have a online store we could host products on. Ladies Offroad Network does have a Amazon Store where we can host your products. Ladies are encouraged to use to help support the network with their purchases. So Excited to Have You Part of Our World! Purchase Now through our online store - www.BowerMediaStore.com - You can ONLY get to the proper page by clicking on the image below. We have the transaction set up as a monthly recurring with a credit card. You can choose to do Check by Mail that will turn into a QUARTERLY billing process. Please contact us directly to set up. * First Payment must be received before completing the launch.